Today’s Peace Love Books post comes to us from Julia Karr, author of XVI and TRUTH. 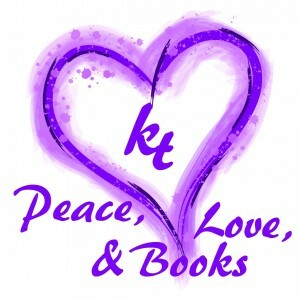 She’s currently working on a third book in the series. I’ve loved a number of pets (both cats & dogs) over the years. With some of them I’ve felt a special connection that’s gone beyond love. One in particular – Loba, a shepherd/husky mix – comes to mind when I think about Love (with a capital L). We lived in a house with hardly any yard, so the dogs (Loba & Maggie) stayed in except for walks and playtime. One afternoon Loba and I were in the kitchen together and I noticed she was looking at me. Really looking. Our eyes met, and what I can only describe as a mutual feeling of adoring each other passed between us. It was amazing, to say the least. Later that day, when my boyfriend got home, we realized Loba had somehow gotten out. She was nowhere in the vicinity and didn’t answer when we called. We hopped in my Jeep and canvassed the neighborhood, he drove and I hung out the window calling for her. Suddenly the thought came to me to stop and listen. I did. What I heard was a little voice in my head telling me that Loba and I were connected by Love, and that connection meant we could never be separated, no matter what the circumstance. I held onto this thought and kept listening until I felt compelled to direct said boyfriend to drive to a particular area. He did. And, still listening to that inner voice, I told him to stop (in the middle of the street no less). Which he did. Moments later we turned around to see Loba running up behind the Jeep! I’ve no idea where she’d come from, or where she’d been, though it seemed obvious to me (but not quite to my boyfriend, who could not stop asking, “How’d you do that? How’d you know she’d be here?”) that the Love that Loba & I shared transcended any obstacles and brought us back together again. 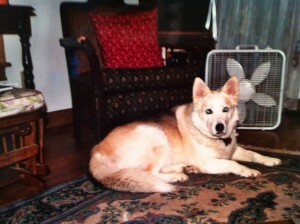 Eventually I let the boyfriend go – Loba, however, stayed with me for sixteen wonderful (but way too short) years. I’m all about the power of capital “L” Love!